REDWOOD CITY, CA (November 1, 2017) — The numbers are in: Chief Marketing Officers (CMOs) are becoming more prominent in senior executive ranks at public companies, and their pay is rising in kind. 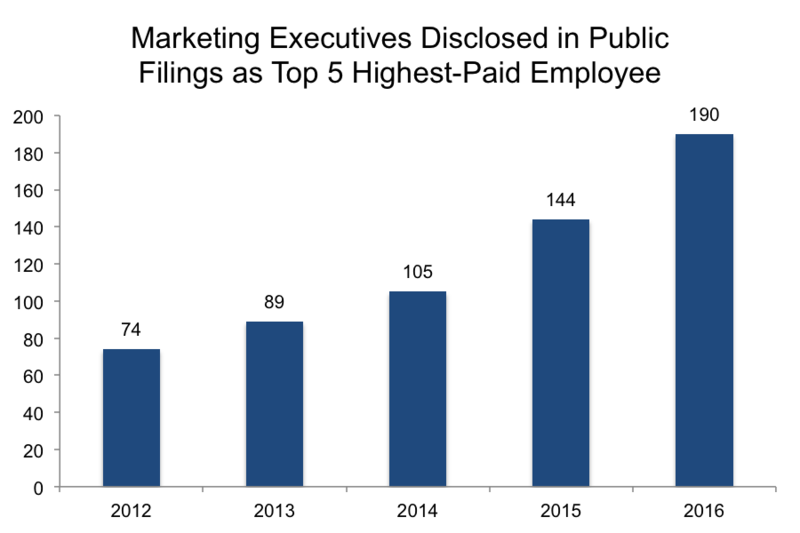 A new study from Equilar looked at the proxy statements of all U.S.-based or listed public companies with more than $500 million in revenue from fiscal years 2012 to 2016 to analyze the prevalence of top marketing executives. In 2016, there were 190 CMOs or other top marketing executives that were named in proxy statements as one of the top five, highest-paid employees, an increase of 157% from 2012. In addition, median pay for the individuals who were included as “named executive officers” (NEOs) in proxy statements increased significantly as well during the years Equilar studied. Overall, median total compensation grew 24.0% over the five-year period, reaching $1,261,755 in 2016, up from $1,017,729 in 2012. The study also revealed data that is consistent among other executive positions: Women are underrepresented in top marketing roles. Representation has increased, however, up from 10.8% of all marketing executives named in 2012 to 18.4% in 2016. One notable data point comparing men and women in top marketing roles is that since 2013, women have consistently made more at the median than men. In 2013, median total compensation for female CMOs was $831,631, 33% lower than the men in the study. 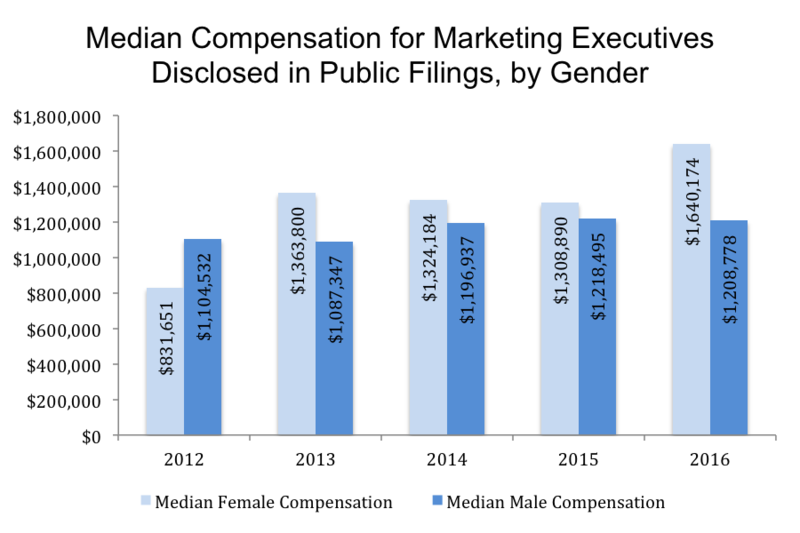 By 2017, compensation for the women in the study nearly doubled to $1,640,174, while total pay for men in chief marketing roles increased just 9.4% in that time frame, reaching just over $1.2 million. Please click here to view the complete study, which includes a form to download the 50 highest-paid CMOs.